What is it that makes Jelly Beans so exciting? It could be that every bean is a new taste sensation sure to be delicious (except of course the nasty black jelly beans and the slightly mouthwashy green ones), or their bright colors heralding in spring and warm weather days, maybe it’s because they are only available once a year. No matter what the reason I always feel a little giddy when I see them roll out the first bags of beans at my local stores. 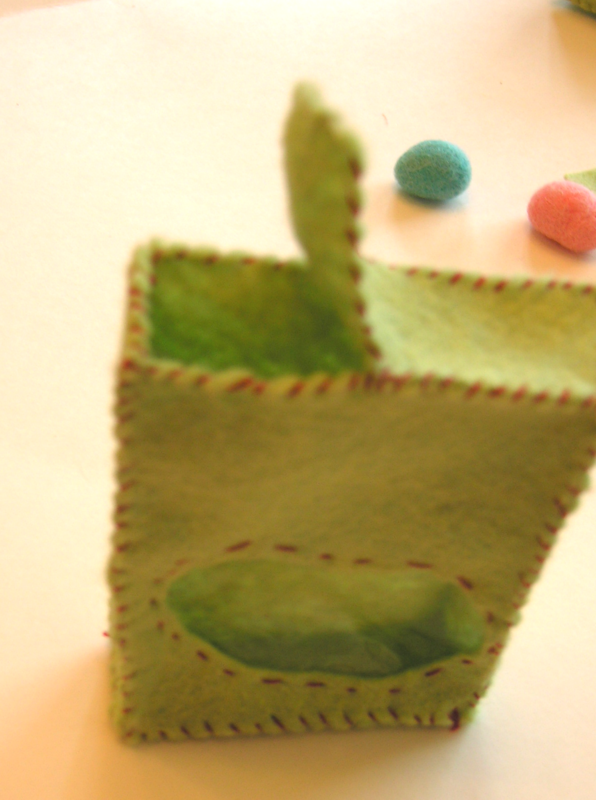 What little felt food play store would be complete without a few boxes this Easter? Colored roving: I used both sets in our mini packs (brights and pastels). About 6″ of roving per bean. Templates at the end of this post. You will need to make your jelly beans and allow them to dry before the next few steps, fortunately the jelly beans dry quickly (an hour or two) and if you have some little ones around you can easily whip up a whole slew of beans in less than an hour. Here is a more detailed run down. Pull off the amount of roving you need from the rest (about 6″ long ). Pull into a thin strand. 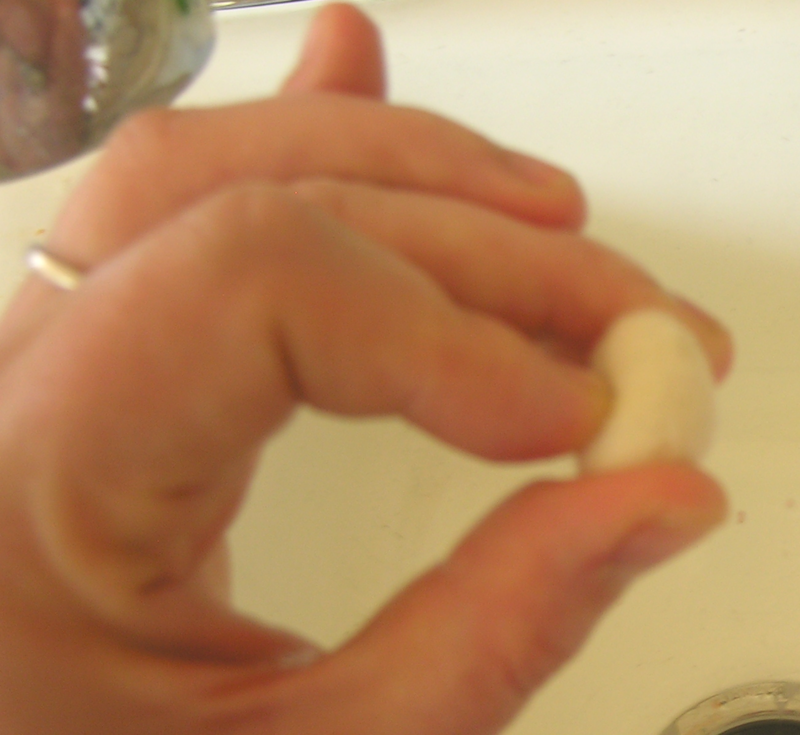 Starting at one end roll upwards (it may help to have slightly damp fingers) wrap around and over to create a ball shape. Your felted piece will be approximately 50% smaller than this so you want your roving ball to be about the size of a large gum ball or quarter. Once you have a reasonable facsimile of a ball shape you will need to begin the felting process. This is done by agitating and shocking your wool. If you have ever been a teenager you should be well versed in shocking and agitating. 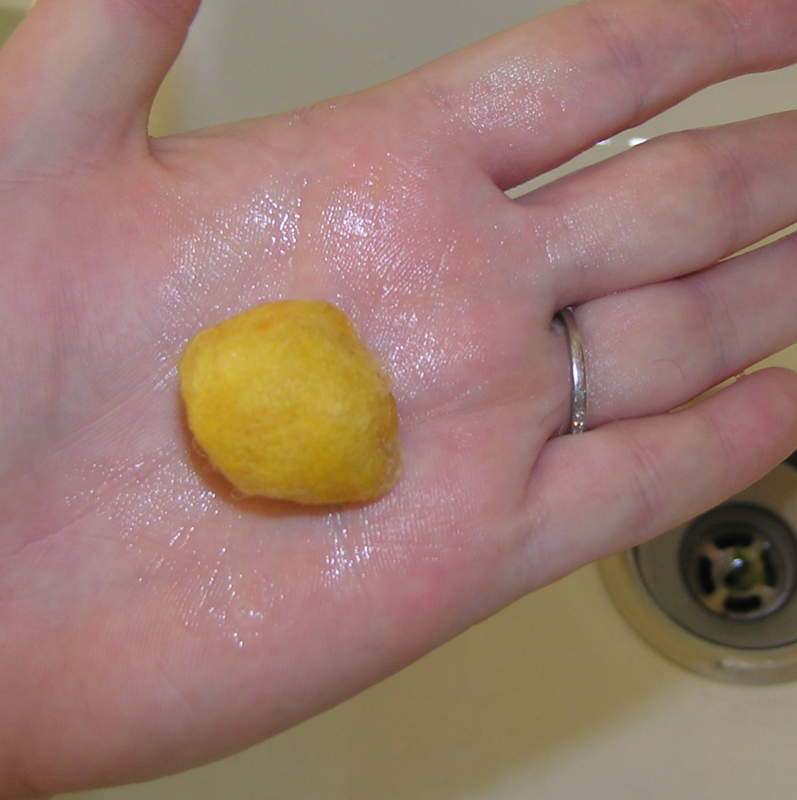 Begin by gently dunking your ball into a bowl of warm water add a small drop (almost a half a drop) of hand dish washing liquid to the top of your ball. Gently move the ball from one hand to another squishing it ever so slightly. Dunk in cool water and squish and then warm water. Lightly rub the wool so the wool catches on itself. DO NOT roll between your hands yet, if you do this the fibers will come apart and you will end up with a very unsightly shape. Continue cradle and lightly squish your soon to be jelly bean from one hand to another for about 30 seconds to 1 minute better to overdo than underdo. You will need to be gentle to prevent your roving from coming apart, my daughter likes to pretend that the ball is an egg. I think that’s a good way of thinking about the level of stress you want to put on your piece at this point. There! You’ve finished the hard part now to finish the jelly beans. making by rolling in between your hands moving the piece from warm to cool water to help shock the wool into place. You should begin to feel your piece firming up. While it still has some give to it roll between your palms in one direction to create more of an oval shape. From here you want to manipulate into a bean shape you can do this many different ways. Working it so that one end is thinner than the other, by thinning out the middle or by pressing a finger into the center while pulling the ends upwards. Experiment and see which method works best for you. Lay out to dry and repeat as desired. Cut 2 of each A, B and C from the color felt you have chosen for your box. Cut the jelly bean shape out of only 1 of your A pieces. Place your vinyl piece over the window area and stitch down using a running stitch. 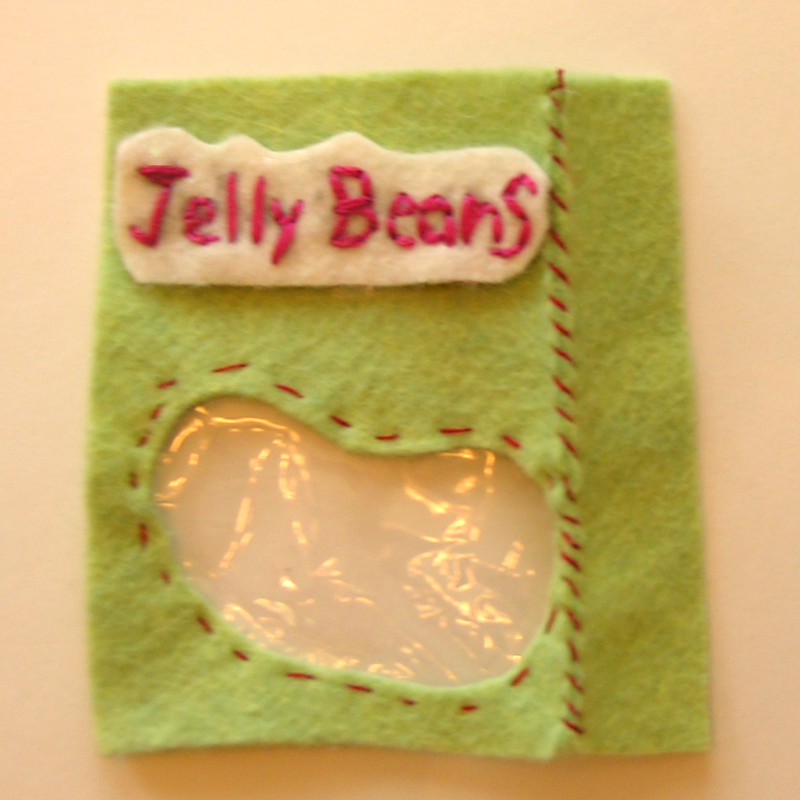 Trace out the letters for Jelly Beans onto your white felt scrap insuring that they will fit on the front of your finished box. Using cross stitching thread and whatever style stitch you like , stitch the letters into place. Cut around the letters to create a more fun feel. Assemble the box by adding one side piece (B) to the side of your completed front and overcast stitch up the side. Continue with the other side piece. 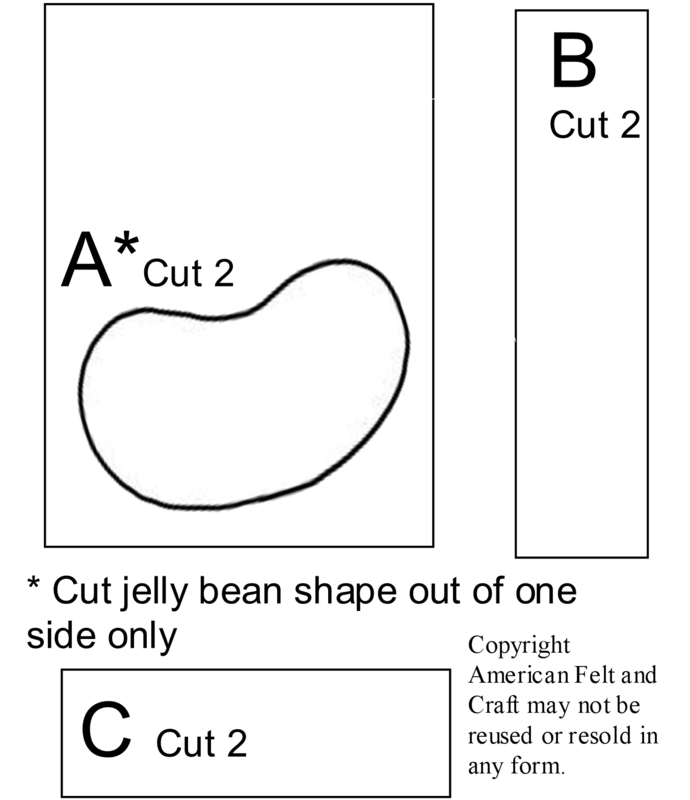 Add back to the box by stitching side pieces (B) to back (A). Stand box on it’s head and stitch the bottom piece (C) in place using the overcast stitch. ‘Before continuing you will need to decide if you plan on having an open jelly bean box or a closed one. 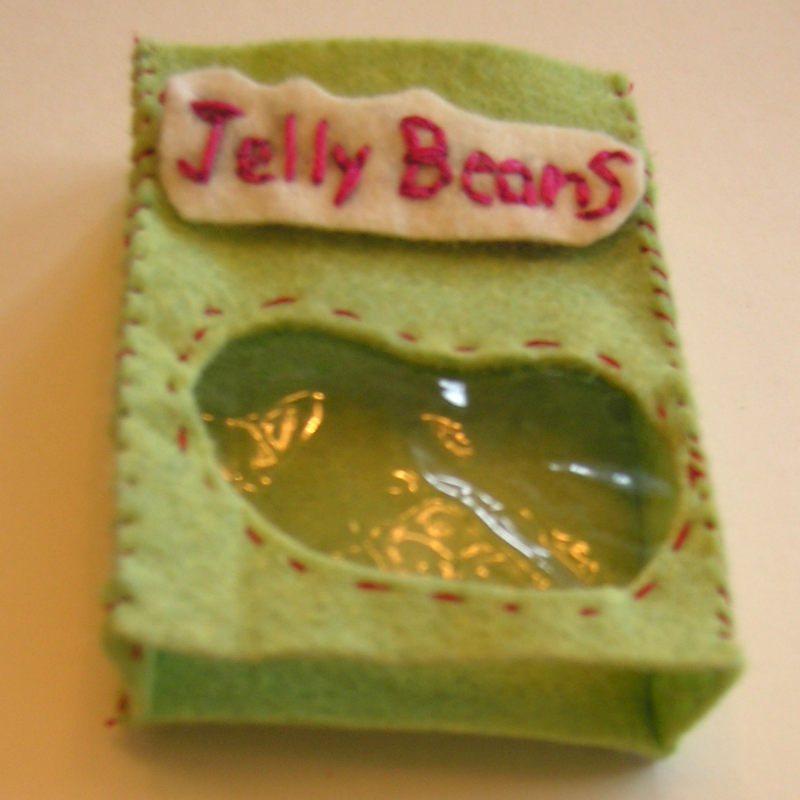 If you plan on using a rattle insert place, box front side down and add your jelly beans until nearly full, slip the rattle into the back so it isn’t visible and adjust jelly beans if needed. Place box right side up again and add top the same way you added the bottom. To make an open box start attaching your top from where you want the opening to begin, stitch around until you reach the matching point on the other side. Continue your overcast stitch around the unfinished edges to create more of a polished look. Enjoy! Copyright American Felt and Craft for personal use only. Don't forget our great Easter collection pattern available now for a limited time only! What’s more fun than play veggies ready for slicing? Besides a barrel of monkeys, which actually just sound dirty and loud to me but to each his own I guess… where was I… oh yeah veggies. 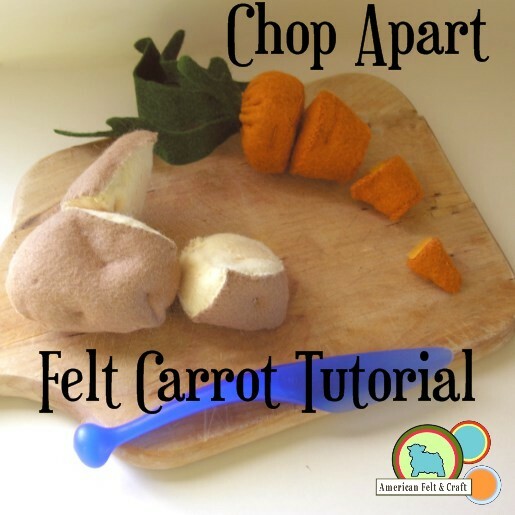 Here as promised is the felt carrot tutorial. You can do this with any felt food you’d like you’ll just need to modify the pattern by cutting it into smaller pieces and creating a Hook and Loop or Velcro inside. American Felt and Craft now stocks 16 diffrent colors to match with nearly anything you can dream up. Keep in mind that most quality Velcro (aka hook and loop) is very strong so for the sake of your pieces posterity I would recommend “cutting” pieces apart with a plastic, wooden, or even felt knife rather than pulling on them. The little blue knife from Ikea pictured above is perfect for this. Thread to match orange colored felt. Cut 1 carrot top from fresh cut grass felt. Roll stem up stem piece and stitch up as shown, stitching can be done with any color thread, it won’t show. Cut Hook and Loop (aka Velcro) into small circles, obviously you won’t be using this color. Match up rounds you have cut out, you should have two of each place scratchy side (hook) onto one of the pieces and soft side (loop) to matching piece, stitch into place as shown. Make sure the right pieces fit together, it will be hard to correct later. 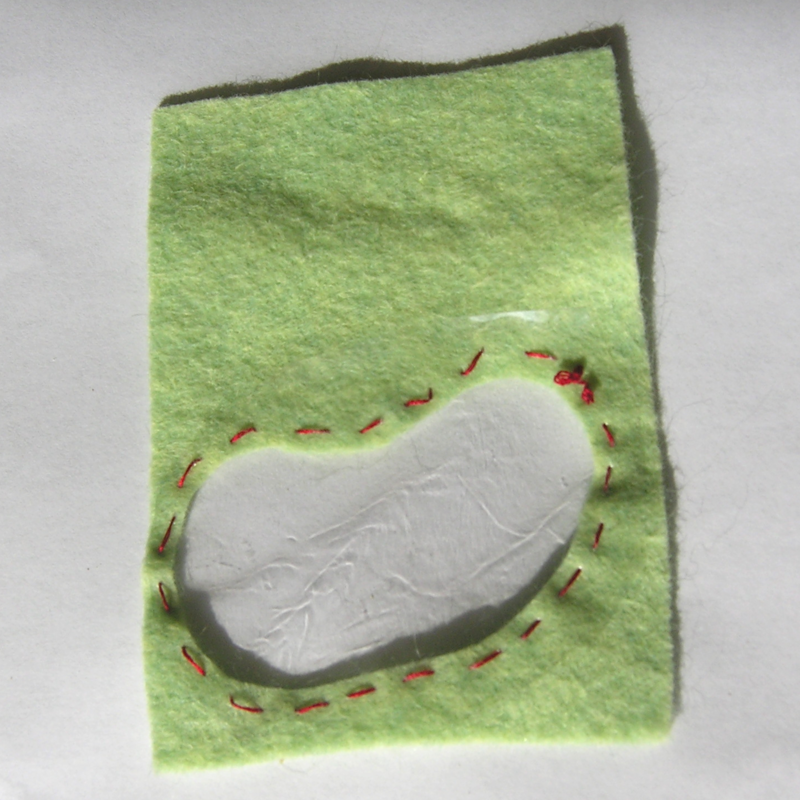 Sew bottom to slice A, the dot represents Hook and Loop (Velcro). Depending on how far in you made your seam on each carrot ring the bottom and top circles may need to be trimmed a bit to fit properly. Set up like a cup and gather stitch around and lightly stuff. Place stem into carrot and pull gather stitches tightly, pass needle through the stem a few times to hold it into place, the top is done. Sew tops and bottoms on to remaining rings as specified above. Stick Hook and Loop (Velcro) sides together and Viola! A felt carrot! OPTIONAL: To create, carrot “dents” make a large running stitch in side of finished slice, Hiding knot in the seam. Come up through top seam, pull tightly and knot. Repeat as desired. Please let us know if you like the felt carrot pattern. We would love to see finished pictures! Enjoy and please remember this pattern is for personal use only! 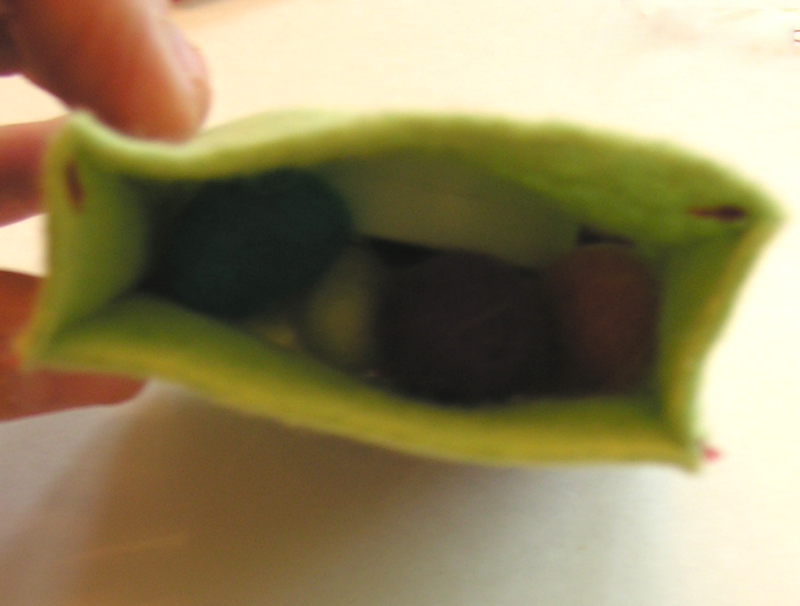 Felt Food 101 – Lesson 2 Right said thread, How to make felt food. 2 years ago I was put on bed rest during a pregnancy it was also around this time that I spent my daughters college fund on a beautiful pink retro kitchen set, I think you know which one I am talking about, you know the one everyone passes and says, “who would pay that! ?” Well I did. Anyway for Christmas that year along with her lovely kitchen she received some wooden play foods, which being very little she promptly used to scratch and dent her wonderful kitchen! Needless to say those little suckers were gracing the shelves of goodwill by weeks end! But what can you do in a play kitchen without play food? I wasn’t about to bring a bunch of plastic junk into my home, then the solution presented itself in the form of felt food. I have now made everything from soup to nuts, literally. After crafting felt food for sometime I began to get frustrated trying to find the bits and pieces I needed to to create the things I wanted to. 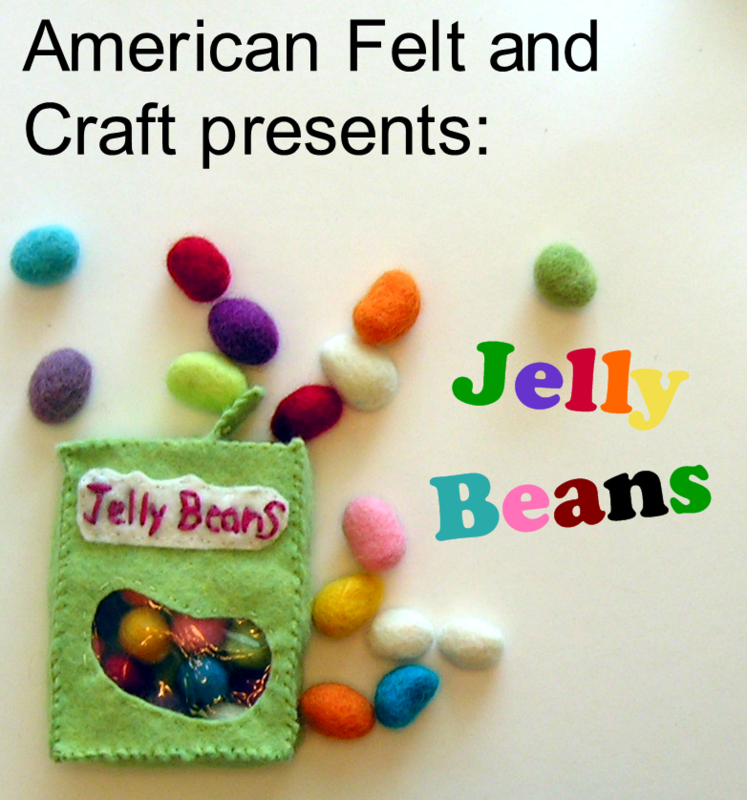 So together with my BFF and fellow crafter Amelia I decided to create the store I was looking for, American Felt and Craft. Please stop in sometime and take a look around. And as always if you have any questions I am just an email away and I’m happy to share my knowledge and a few of my favorite patterns with you! For making felt food just about any thread will do, if you’re going to make heirloom quality felt food, stand the test of time, your great granddaughter will be playing with it, felt food you’re going to need sturdy thread. I highly recommend a cotton or polyester thread, keeping in mind that polyester threads have a bit of a sheen to them and often distract from the piece a little, although there are cotton coated polyester threads. Personally I prefer 100%cotton since the threads are more flexible and softer than other types and since felt absorbs light the felt blends well since cotton usually doesn’t have the shiny qualities of other types. In terms of strength both cotton and polyester are less likely than other threads to break, snag or form unwanted knots. You may see thread called quilting thread this is ideal for felt food since the threads are thin and smooth but tough enough to hold up to hand sewing, and blend exceedingly well, the problem with quilting thread is it’s color range is extremely limited. 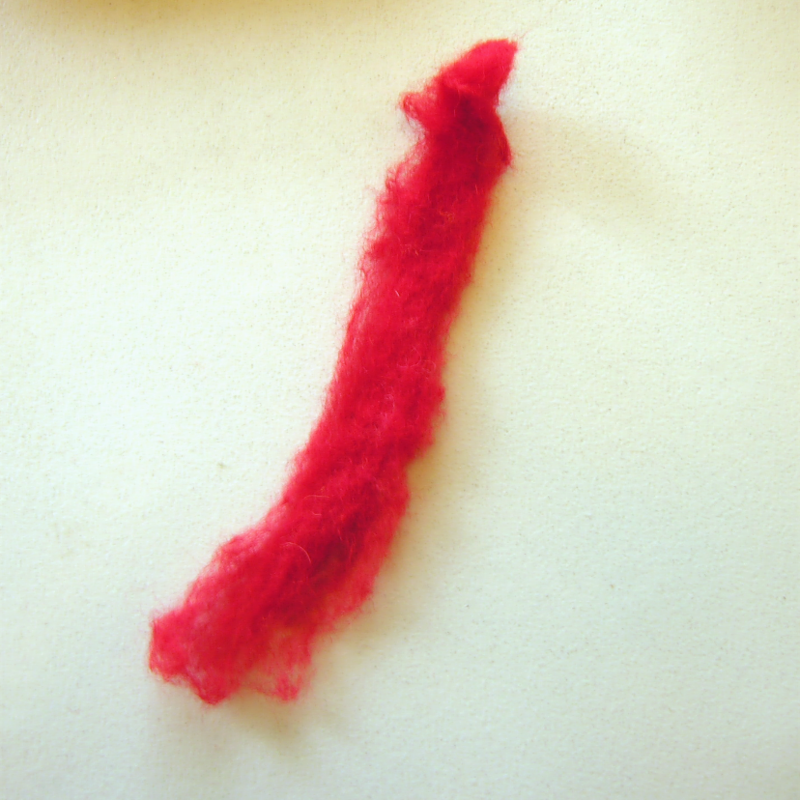 Don’t bother sewing felt together with silk or rayon thread it’s like attempting to hold it together with paste. And forget about the heavy duty carpet or button thread, sure it’s durable but it’s so thick that it tends to distract or misshape a piece. The giant spools sold for sergers are great values but tend to tangle and knot easily because they are generally made with a lower quality short cotton strands so I wouldn’t buy any colors you don’t plan on using frequently. Lately I have been using the skeins of cross stitching thread, they are cheap and come in more colors than I knew existed, I just separate the threads and sew with just one or two. Occasionally some cross stitching threads may leech dye so you may want to test them prior to use and avoid lower quality brands as they are more likely to bleed. Sewing with specialty threads can take a felt piece to the next level. Variegated colors, for corn cob kernels, metallics for the shine on a cherry, iridescents for flower details and glow in the dark just for fun are all great details. <br>You might try experimenting with these keeping in mind that metallic and clear threads can be hard to knot and in the case of metallics may break very easily so both are only best used only for detailing. When picking a thread color you should consider buying thread a shade darker than your felt, once sewn it will actually appear closer to the color than exact matches. Felt absorbs light rather than reflecting it so it’s very easy for the human eye to pick up shade differences so try to match the tones as well as possible, again going a shade or so darker for maximum benefit. Lighter threads are great for highlighting and adding depth to a piece. I hope this covers any questions you had on thread selection, please feel free to leave any further questions, tips, or suggestions in the comments section. I must have sewn at least 100 different felt foods since I started my daughters collection. One afternoon having nothing whatsoever to do with myself I decided to make felt saltine crackers, why? Because I couldn’t think of anything else I hadn’t yet made. These are actually really easy to make and you can whip up an entire box of them in a single afternoon. What started off as an after thought has quickly become my absolute favorite felt food of all time, sure some people like frilly wool felt cupcakes and others prefer the more solid and interactive felt sandwich, there is something so basic and cool about these. I love them so much that I can’t stand if one gets lost , it seriously creates some anxiety and I have to dig through the sea of felt food crammed into her little pink retro style fridge and retrieve it. When I finally find my (notice I call it “my”) lost little crackers, I always place them all together back in their little plastic container and walk away smiling. Here’s hoping you love yours as much! Wool batting- about 4 inch square, you can also use acrylic batting but you will need to double them possibly even triple since they don’t have the same loft as wool, you can also use stuffing but you will want to make it lay as flat as possible. 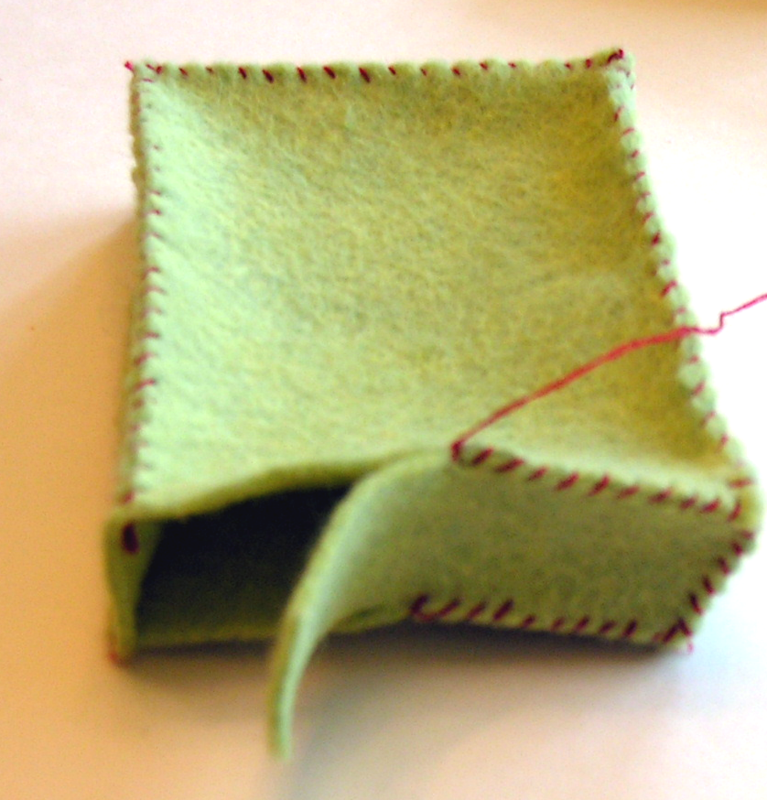 Cut the felt into a 2.5 inch square and the batting into a 2 inch square. See diagram below for approximate cracker size, ignore the dots for now. Sandwich batting between two felt triangles and whip/ overcast stitch up sides in coordinating thread I used red for clarity. (at this point you may want to mark out the pattern of dots shown above with pencil if you don’t want to wing it) Now knot your thread and go in to the cracker through the side. Pop the needle through the first dot on the template above, sew a small stitch pulling thread slightly so the batting puffs up around the stitch. Pop needle back out on the opposite side and make another small stitch mirroring your first. Now instead of moving the needle out of cracker move needle head between the sandwiched felt squares (where your wool is) and out through the next dot on the template above . Sew a small stitch once again pulling it tight and repeat for the last indentation on the first row. Start dots on second row by once again moving in between your two felt pieces. Place your next stitch underneath and in between your dots above. The line up doesn’t to be precise. This becomes second nature after you do one or two. Now move between the felt again and create the second and last stitch on the second row, the row patterns are 3, 2, 3, 2, 3 . Proceed to the next set of three lining them up directly below the first set of three. Finish your cracker by coming out the side and hiding your knot between whip stitches…Tada! Email me at Customercare@feltandcraft.com with pictures of your completed crackers and I will happily post them with your info below. Technically you can actually make soft play food from anything. 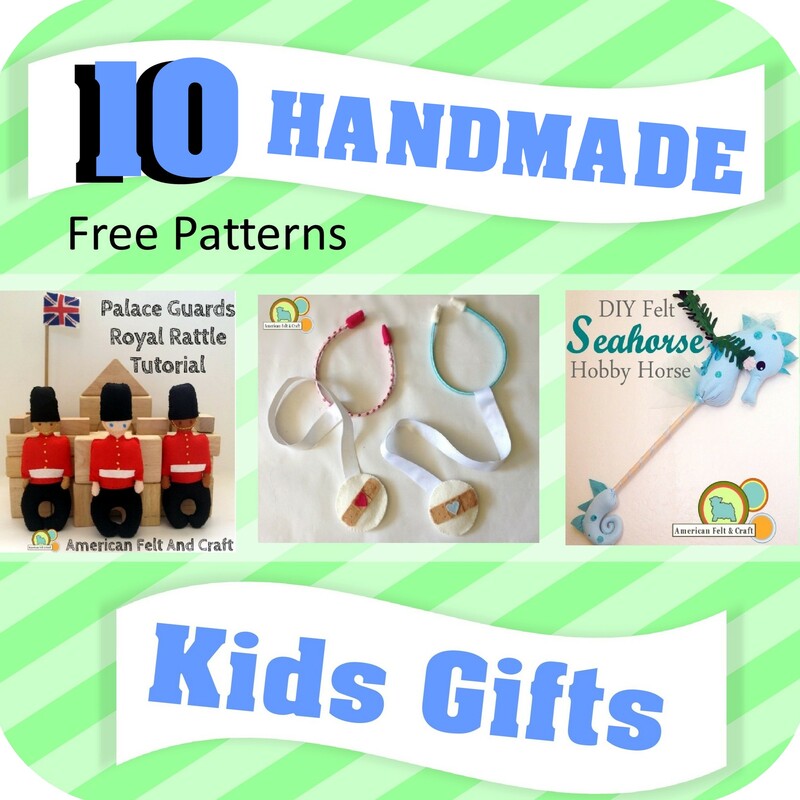 But take heed most fabrics don’t hold up to the wear and tear a child can give to a well loved toy and if you’re not fond of surging EVERY seam to avoid a catastrophe you’ll need something that doesn’t unravel easily. This is why felt is the obvious choice. It also comes in a litany of colors and spans the gap between to thick and tough (like canvas) and too floppy (like cotton) landing firmly in the center -perfection! When making felt food coloring is key, the closer the color is to the actual food the better it will look and the more recognizable it will be. It can be tough finding felt in a full range of colors since most craft stores want to sell you 5 maybe 6 colors, unless you want to buy plastic felt and trust me you don’t. When I started out I used eco-felt after about a month of serious use I was forced to throw most of the items I had crafted from them away. They fuzzed and tore at the seams, and nothing is more frustrating than spending a whole day making something you want to be around for your grand kids only to see it misshapen, torn and fuzzy the next week. For more on this you should read Felt smackdown, I think you’ll see why I consider 100% wool and blended felt to be heirloom quality and acrylic/ ecofelts to be junk. Your time is worth something whether you spend a few days or even a half an hour you’ll want to know that your artistic creation will last a long long time, and you ‘ll be surprised how little felt it takes to make felt food. Which is why it’s totally worth buying a higher quality felt. But before you can buy your felt you’ll need to know how much to buy. When I am planning a project I first make a list of everything I am planning on making, then visualize the pieces on a standard size piece of paper, sometimes I even draw them out to see how the sizes look. At AFC we sell all our felts in 9 x12 sheets which are a bit larger than a standard size sheet of paper, the size helps to make it easy to plan projects and buy all the colors you need with having to store a ton of felt or spend a fortune. For example lets say your going to make pancakes, for that you will need to decide the size, personally I think a 5 inch circle is about right, you’ll need a front and a back so that means on a standard 9 x 12 sheet you can make one pancake, keep in mind you will be left with some great scrap, or frap (felt scrap) as we call it around here. These can be used for cookies, tortilla chips, wontons or a million other things. You should also keep in mind that most felt is dyed in lots so there are some very slight color variations this is usually not a big deal but if you’re doing large pieces like cakes your really going to want to order all the felt you need and some extra for mistakes. Lastly if you’re not sure of the colors (i.e. which is tomato sauce red?) I would HIGHLY recommend picking up whatever you are considering. You cannot tell color properly in a craft store the light is not a natural light and you may find your watermelon pink is actually a raspberry. And although all of our pictures are taken in a natural light there may be slight variations based on monitor settings and dye lots. Personally I have always bought all the colors I am considering , it’s usually pretty easy to narrow it down to 2 or 3 choices and it’s much easier than making a trip back to the craft store or placing another order, plus then I have more colors on hand when inspiration strikes. Stop by and check out the store. 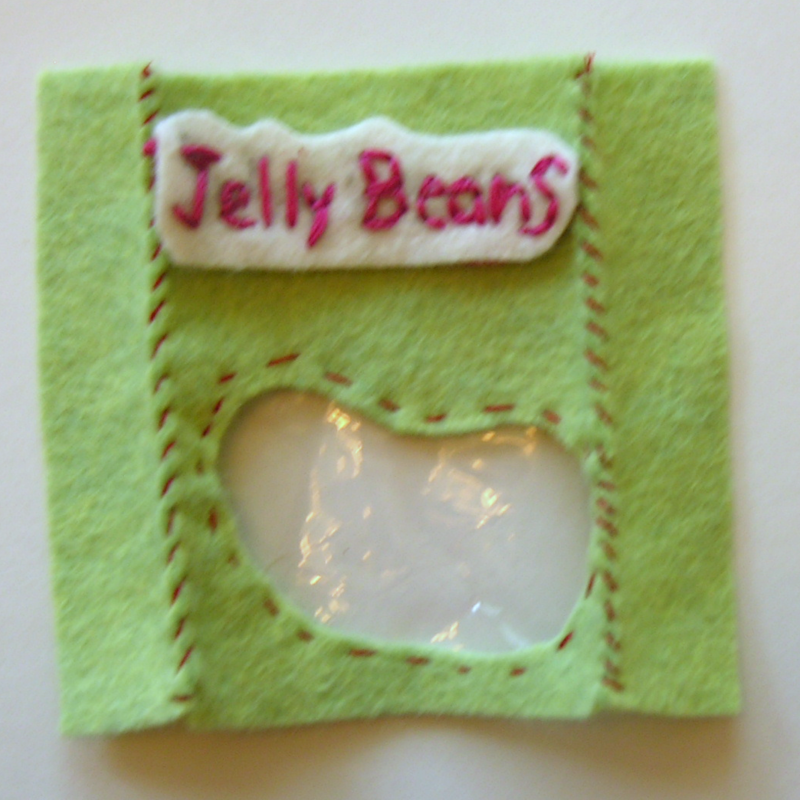 Free Felt Food Pattern- Cherry Pie Tutorial Directions and Templates. You can buy nearly everything you need to make your cherry pie at American Felt and Craft, your purchase keeps these patterns free. 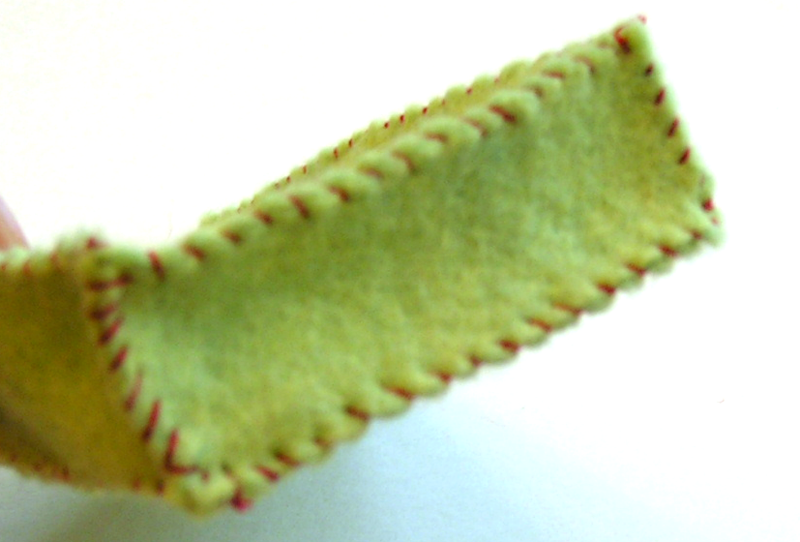 Lipstick felt – Cut 1 8 inch round. And set it aside. Toffee- cut 8 1″ strips lengthwise (12″ long) using pinking shears. Cut 6 Lipstick colored side pieces 1.5″ x 9″ long. Lay 4 of the strips across your pie face as shown. Weave second set of strips into the first using an over under method, to create a lattice design. Using a small dollop of felt glue join the strips together where they meet, work slowly to avoid mistakes. Use the smallest amount of glue possible, too much glue may make your felt tough to sew through. Please note: DO NOT GLUE LATTICE TO RED PIE FACE, PIE TOP IS ONLY THERE TO JUDGE LATTICE PLACEMENT. Your lattice will look like this when completed. Trace your foam wedge shapes onto red felt. If you aren’t using American Felt and Craft’s pre-cut foam pie wedges you can cut another 8 inch circle from paper and divide it into 6 sections and cut down the sides of the triangles but not through the center so you can trace the wedge shape but still have an intact paper circle for use in an upcoming step, as shown below or you can use the wedge template above. Mark out spots where you will place your cherri es, you may want to place lattice over to assist in selecting the areas you want to place the cherries, you’ll want to use about 1/2 of your cherries. To create your cherries carefully cut all wool felt balls into halves. Using small amount of felt glue, glue cherries into place, wait for them to dry about 15 minutes and stitch them down securely, they may be choking hazard for small children so you want them to be extremely secure. Repeat this process with the 6 side pieces. Trace 8 inch circle onto lattice then cut into wedges, template below. Your pie top can be used to trace the circle if needed. Sew lattice wedges to pie top wedges, you can also use glue for this but use carefully you don’t want any dried glue on pie slices. Place lattice/cherry piece on top of foam form, place 1 toffee colored bottom below wedge and wrap side piece around as shown, pin into place. Sew top and bottom to sides using a whip or overcast stitch, back open. Whip stitch around back bottom and back sides. Then stitch through back and into pie top and out again using a running stitch to secure top lattice piece. Now fold raw end in towards pie and using a running stitch stich down. Using a long whip or overcast stitch sew along top pulling tightly to form crust ridges. Use tan thread the red thread is for demo purposes only. I hope you enjoy your new felt pie. Pattern for personal use only please.